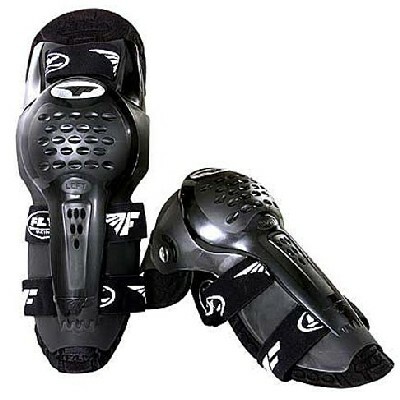 The Fly Racing Moto Knee guard system may be entry level in terms of advanced motocross/enduro knee protection but unless you need an Ironman style exoskeleton these should prove to be more than adequate for most of your riding needs - at a price that can't be beat. We've sampled a large number of two-strap knee and shin guards over the years and while we appreciate the low volume and extreme light weight the less than precise fit of low-end units tends to diminish comfort during a long day of riding. The enhanced fit and security afforded by the third over the knee strap more than justifies the extra volume and complexity in our view. 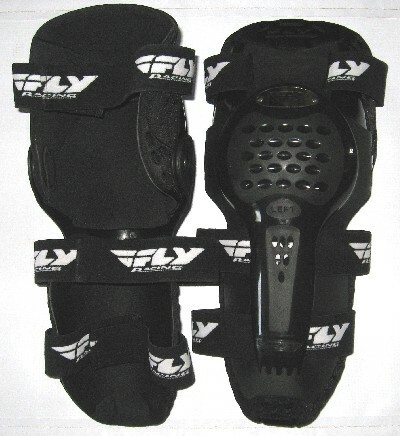 The Fly Moto Knee system comes in contoured left/right pieces each with a hard plastic exoskeleton containing an articulated knee joint and a laminated foam inner liner. The three straps attach via Velcro fasteners. The cushy inner liner accommodates a broad range of adult leg sizes quite comfortably. The articulated knee works transparently and the Moto Knees are so comfortable that it's easy to forget that you are wearing them after just a few minutes of riding. I tried out a set of Moto Knees on a 130+ mile long desert enduro and found them to perform flawlessly. I wore them under a a set of over the boot style pants and forgot that they were there until I changed back into street clothes at the end of the ride. At an MSRP of $49.95 Fly Racing Moto Knees are about double the price of most bare-bones knee protectors but much less than high-end systems - representing a sweet spot for most riders in terms of both price and performance. The only thing that we'd recommend is that Fly Racing bin the cheesy metal container they come in and knock a buck or two off the price. Attachment system: Three straps, one above the knee.